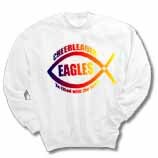 T-Shirts and sweatshirts for your favorite team, church group, or family reunion. For small quantities, full color, or personalization, you've come to the right place! For the very best in shirts, we offer PREMIUM t-shirts, which accept dyes in the same permanent process that your polyester sportswear does. These shirts are incredibly soft, comfortable, and will never fade or crack or peel. The image is dyed right into the fabric and will look the same year after year as it does when it is new. The colored premium shirts now include safety orange and safety green, for maximum visibility and safety for construction and highway workers. These shirt also have moisture wicking properties to keep you cool. NEW! 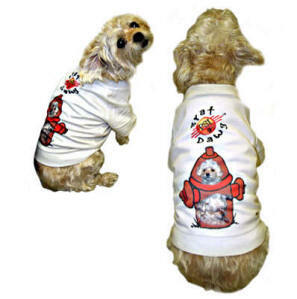 We now have doggie shirts so your dog can step out in style. Order a matching doggie t-shirt for a coordinated look. Our specialty is the attention we give to your image to make each shirt look its best. 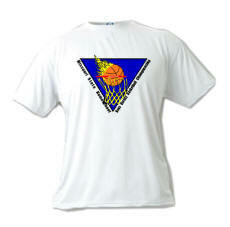 Order your customized shirt today. We can get ladies styles, muscle t's, ringers, hoodies, performance shirts - please inquire and use the sweatshirt section for a guide to what the price will be (allow 1 extra week for delivery). Here is a link to the complete line from Vapor Apparel that we can get. It is a 5.5 mb PDF document. We decided to drop our line of cotton shirts but do have some still available - please inquire. For proper sizing, measure from the base of the neck to the base of the tail. Small fits 9" to 12"
Medium fits 13" to 16"
X-Large fits 21" to 24"
Shipping/handling starts at $7.50 for one shirt. FREE SHIPPING for orders over $50. Prices are for each shirt. 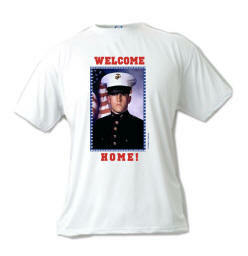 Similar shirts, such as with a text change only, can be grouped for the pricing breaks.